It might seem blazing fast, but, in fact, when you think the vast distances between the celestial objects in the Universe, the speed of light is actually torturously slow. For example, Alpha Centauri, the nearest star system to the Sun is 4.3 light-years away from Earth – the light emitted from them takes 4.3 years to reach us. Our Milky Way galaxy is around 150-200 thousand light years in diameter. That means sending messages back and forth between on either side of the galaxy would take hundreds of thousands of years. This is one of the reasons that there may be no Kardashev Type III civilization in the Universe (a civilization which can control its own galaxy – you can think it as Isaac Asimov’s galactic empire in the Foundation series). Even in our own solar system, the speed of light is so slow, communicating with spacecraft takes sometimes hours because of that. For example, it takes almost 20 hours for the signal to reach Voyager 1 (so it is around 20 light-hours away from the Earth). Sunlight travels at the speed of light. Photons emitted from the surface of the Sun need to travel across the vacuum of space to reach our eyes. It takes sunlight an average of 8 minutes and 20 seconds to travel from the Sun to the Earth. 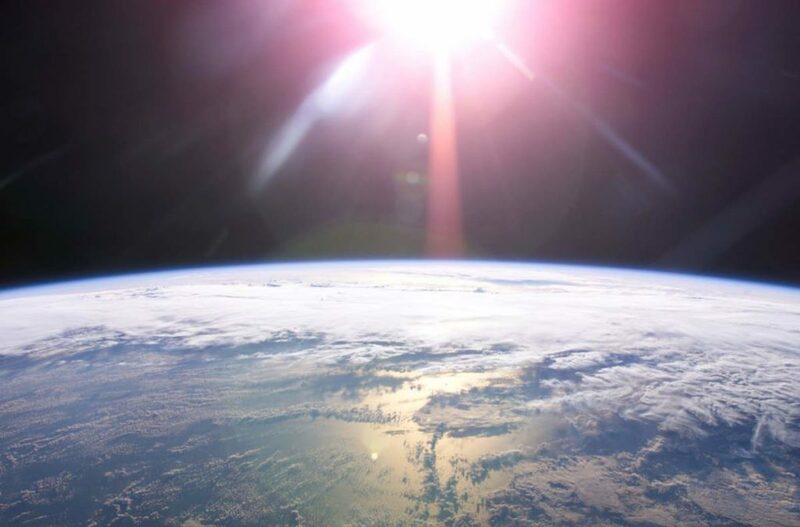 Image: NASA – ISS013-E-78960 (9 Sept. 2006) – A rising sun and Earth’s horizon are featured in this image photographed by an Expedition 13 crew member on the International Space Station. To put things into perspective, NASA Goddard Planetary Scientist James O’ Donoghue created three animations to show how fast (or how slow) the speed of light is. The first animation shows the light orbiting the Earth. The equatorial circumference of Earth is 40,075 km (24,901 miles). If our planet had no atmosphere (air refracts and slows down light a little bit), a photon skimming along its surface could lap the equator nearly 7.5 times every second. If you could make light bend around Earth, it would orbit 7.5 times per second (near the surface). That’s 0.13 seconds per orbit! Animation by Dr. James O’Donoghue using NASA image of Earth. The second animation shows the light is traveling between the Earth and the moon. The average distance between the Earth and the moon is 384,400 km (238,855 miles). It takes a little more than a second for a photon to cover that distance. This is the distance between the Earth and the Moon with the correct sizes and scales. The real-time speed of light is also shown. Animation by Dr. James O’Donoghue using NASA imagery. The third animation shows the light traveling between the Earth and Mars. Now the speed of lights starts looking really slow. And this is just Mars, one of the closest planetary body to Earth. Please note that In theory, the closest that Earth and Mars would approach each other would be when Mars is at its closest point to the sun (perihelion) and Earth is at its farthest (aphelion). This would put the planets only 33.9 million miles (54.6 million kilometers) apart. However, this has never happened in recorded history. The closest recorded approach of the two planets occurred in 2003 when they were only 34.8 million miles (56 million km) apart. This is the distance between Earth, the Moon, and Mars with the correct distances but with Earth, Moon and Mars 20 times bigger (so you can see them!). The real-time speed of light is shown. Animation by Dr. James O’Donoghue using NASA imagery. It would take around 140 hours to reach the edge of the solar system a photon emitted by the Sun – see the previous article titled “Leaving the solar system at the speed of light”.